Millennium Guitar, Volume 1, features some of the most beautiful guitar music from the last thousand years. Order from CD Baby----they're fast and reliable! 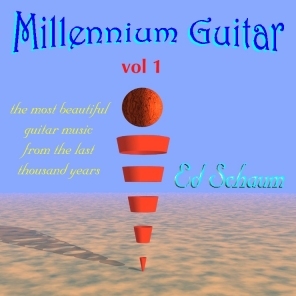 One of the most breathtaking albums of solo guitar performance in recent memory, Millennium Guitar was recently released by NYC-based guitarist Ed Schaum. On the twelve track CD, Schaum demonstrates a unique flair for interpreting a wealth of classical guitar music composed by masters such as Isaac Albeniz, Francisco Tarrega, Andres Segovia and Fernando Sor, as well as living guitar legends such as Steve Howe and Steve Hackett. In addition to the exhilarating lineup of solo guitar classics, it's also well worth noting how skillfully the CD was recorded. Besides his solo guitar work, Schaum also has an excellent progressive rock CD out. For Ancestral Voyage - the CD debut from Schaum's prog-rock group Dreamship - the guitarist unites with keyboardist/vocalist Timothy Martin and the results will be widely appreciated by progressive rock fans. Each piece is masterfully played. Technical production and recording quality of the compact disc is superb.The highlights of the album were the Steve Howe-based arrangements and compositions which were played flawlessly and with a flowing technique. The stark setting of pure acoustic guitar works quite well. Its excellent guitar work should be studied further—a nice listen!. Ed Schaum's classical guitar performance is fluid and precise. The debut solo album features several well-known favorites by Vivaldi, Segovia and Mozart, as well as many unique pieces by Steve Howe, one of Ed's more modern influences. All of the pieces featured are fantastic, combining true talent with subtle zest. Aspiring guitar slingers should give this new age/classical crossover a listen for a lesson in dynamics... the recordingquality is good and the guitar playing is jaw dropping. Highly skilled guitarist who seems, at the moment, content to interpret the work of others -- most notably, Steve Howe and Andres Segovia. Able, textured playing expresses Schaum's voice without compromising the integrity of the originals.